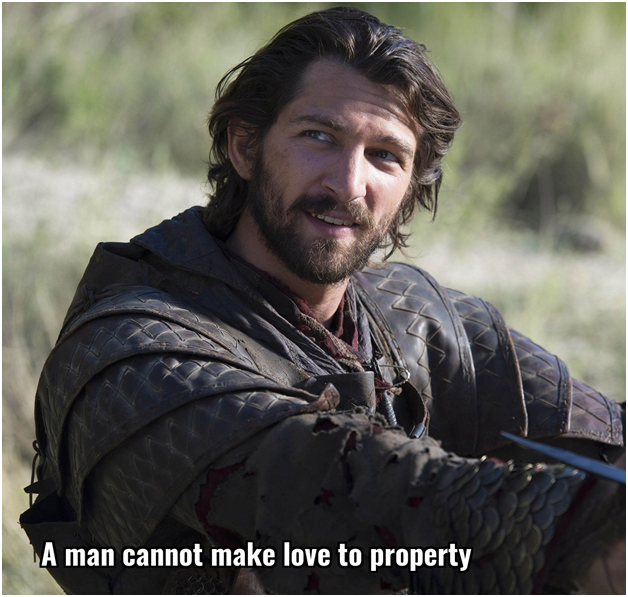 Daario Naharis is no aristocrat. He was born to a prostitute in Tyrosh and sold to a slave master. Through sheer talent, he rose through the ranks and now owns the Second Sons, and is practically the military commander for Daenerys. He does not mope over the opportunities life denied him, and instead believes in making lemonade. Daario speaks the Common Tongue, High Valyrian and also some Dothraki. He is a highly skilled fighter, and is efficient in the combat styles of a Dothraki screamer, a Norvoshi priest, and a Westerosi knight. He wields a Dothraki arakh and Myrish stiletto with equal ease. Remarkable, wouldn’t you say? Having sworn fealty to Daenerys, he is unflinching in his dedication. There might be sparks now and then between him and Ser Jorah Mormont or Grey Worm, but that does not come in the way of their being a highly efficient and understanding team in times of crisis. We do not, however, recommend killing your friends, (like Daario killed Second Sons leaders Mero and Prendahl na Ghezn), when you develop a new crush! Amidst all the fighting and the intrigue, Daario retains a dry, sarcastic sense of humour. You cannot deny that this quality in a seasoned killing machine is very endearing! Whether or not to colour your long hair blue and fork your beard three ways is totally your call, all we’re saying is that a distinctive style of yours, which apes no one else, is immensely impressive! Daario loves Daenerys, no doubts there. And their relationship, though not the rom-com little Sansa would dream of, is based on mutual respect and honesty. There are no power games, no jealousy, and a perfect understanding of what the other wants. Daario is doting in his love, shares her ambition, but also keeps giving her reality checks. We approve! What else do you love about this dreamy, handsome, and legendary bundle of contradictions? Share with us in the comments below!